Fans of strategy games (and sheep) will enjoy TowerMadness HD by Limbic Software, which expands on the traditional subgenre of “tower-defense” with sharp graphics, exciting gameplay and innovative online features. Set in an idyllic countryside (suspiciously reminiscent of Lancashire), you must defend your prized sheep from marauding aliens with an impressive array of powerful and customizable defenses. Farmer Brown wishes he had this kind of firepower. While certain tower-defense titles such as GemCraft, (the smartly titled) Desktop Tower Defense, and my personal favorite, Gratuitous Space Battles, have achieved a moderate level of success and popularity, the subgenre still suffers from its unfair characterization as the zealously-policed niche of timid, addled nerds, tabulating and modeling their way to victory. For many, factors such as the heavy emphasis on preparation and planning, inattention to story, and the tendency towards monotonous gameplay—all led to the genre's bad reputation. 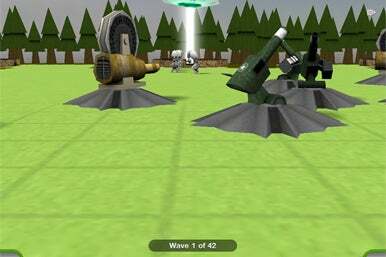 However, drawing on both the unique capabilities of the iPad platform, and the creativity of the vast tower-defense development community, Limbic has created a more accessible alternative to typical tower defense games. In what this reviewer cannot help but interpret as an agrarian-survivalist allegory against the relentless, inhuman global economy, the player may make use of 9 upgradeable weapon types across 18 cartoony, yet crisp maps. The alien menace (Greys and Bugs of various size) has some pathing and evasion ability, yet the difficulty is largely a factor of the aliens’ individual toughness and numbers, which as the game wears on, can become tedious. The action is in real time; quick-thinking and risk-taking help alleviate the tedium of the constant waves. While boasting already-impressive gameplay, it’s the online functionality that stands out: regular downloadable content is available through Limbic Software, a cool replay system helps novice players negotiate the learning curve, and suitably-ambitious players may even compete for bragging rights, or alternatively lucre, via global leaderboards. Add to that a helpful tutorial system, HD graphics, multitouch pan and zoom functionality, and sheep—and you’ve got yourself a solid game. The takeaway: Intuitive, quirky gameplay, competent HD integration, and a robust online experience come together for a fun and enjoyable experience, albeit one limited by the inherent difficulty of “accessible tower-defense."